Do you want to undertake Market Research, Engage with your Employees or Listen to the Voice of your Customers? Web Surveys allow respondents to undertake the survey in the privacy of their own location and allow respondents to reply using a range of modes such as smartphones, tablets, laptops as well as desktop computers. Some web survey applications include features to manage Computer Aided Telephone Interviewing (CATI), manage communities and discussions, allow Multi-language survey creation, scripting, collaboration and even undertake mixed mode surveys with combined on-line and off-line surveys on tablets and mobiles. 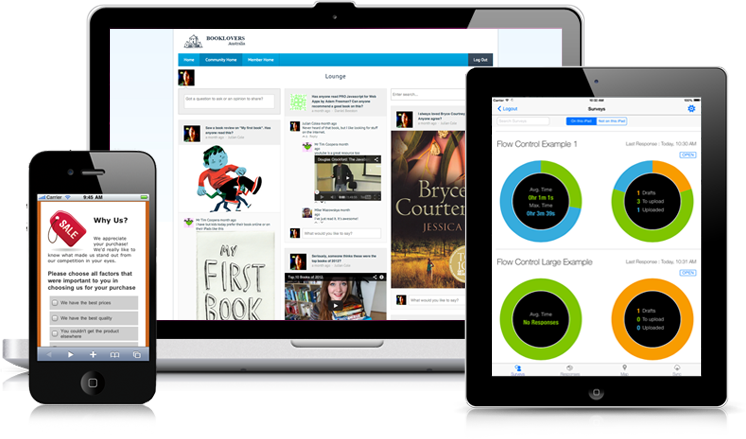 Create advanced surveys for the Web and mobile devices. Use scripting, quotas, data piping and other advanced features to create very powerful market research surveys. Our computer Assisted Telephone Interviewing module adds a true “Mixed Mode” capability to surveys. A survey can be completed on the web, or by an interviewer on the phone. All the applications are mobile friendly. Your participants will always be able to be engaged whether at home, work or somewhere in-between. Build communities and panels that feature flexible theming, “fluid” layout that looks great on desktops and mobiles, profiling and engagement tools, and “live” feedback to members. Discussions within a community feature a modern interface, all the interactions members have come to expect (like, dislike, follow etc. ), and most importantly excellent analysis tools for market researchers. 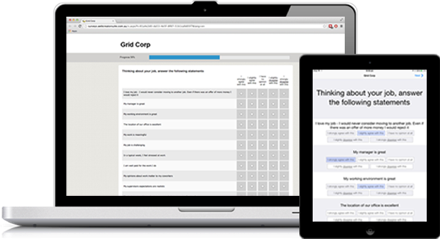 Manage the entire focus group recruitment process. Screen candidates, place them in appropriate groups, send reminders via Email and SMS, and track attandence. Since 1998, Dipolar has provided survey software and services to a worldwide client base of individuals up to large corporations. Over my years in market research I've used a number of online survey platforms and nothing comes close to WSC for ease of use and reliability. From quick, simple ad hoc projects to complex tracking studies, WSC handles it with ease. In the ten years we've been using Dipolar products the team has always been approachable and willing to help - their support is second to none. Their software is constantly evolving and enables our company to offer the latest and greatest to our clients. If you're after a well rounded, cost effective survey platform you can't go past WSC. We run multiple market research surveys every week to thousands of respondents. We rely on Dipolar's market research software for our entire Web-based survey business, and no other software package could come close to the value they provide for our business. Dipolar Pty Limited is a software development company that was founded in Sydney, Australia in 1998. The company is privately held by it's founders and employees, and over the years has proven that it is possible to thrive with a quality product and exemplary support in today's challenging marketplace. It became clear early on that there was plenty of room for a new, high-quality "out-of-the-box" survey solution, and our flagship Web Survey Creator (WSC) product has been very successful. Julian Cole is a Director and Co-Founder of Dipolar. Julian manages strategy and sales within the business, and is responsible for our Web Creator Suite community, discussions and insights software. James Beauchamp is a Director and Co-Founder of Dipolar. A veteran of the software development business, James has a broad range of experience in Microsoft development technologies, and leads our development teams.